Some of the most prized violins in the world were crafted in the Italian workshops of Amati, Stradivari, and Guarneri—master violinmaking families from the 17th and 18th centuries who produced increasingly powerful instruments in the renaissance and baroque musical eras. These violins, worth millions of dollars today, represent the Cremonese period—what is now considered the golden age of violinmaking. Now acousticians and fluid dynamicists at MIT, along with violinmakers at the North Bennet Street School in Boston, have analyzed measurements from hundreds of Cremonese-era violins, identifying key design features that contribute to these particular violins' acoustic power, or fullness of sound. The researchers found that a key feature affecting a violin's sound is the shape and length of its "f-holes," the f-shaped openings through which air escapes: The more elongated these are, the more sound a violin can produce. What's more, an elongated sound hole takes up little space on the violin, while still producing a full sound—a design that the researchers found to be more power-efficient than the rounder sound holes of the violin's ancestors, such as medieval fiddles, lyres, and rebecs. 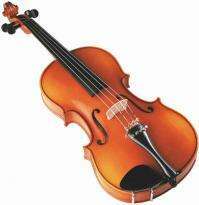 The thickness of a violin's back plate also contributes to its acoustic power. Violins carved from wood are relatively elastic: As the instrument produces sound, the violin's body may respond to the air vibrations, contracting and expanding minutely. A thicker back plate, they found, would boost a violin's sound. But were the design changes intentional? To answer this question, the researchers worked the measurements from hundreds of Cremonese-era violins into an evolutionary model, and found that any change in design could reasonably be explained by natural mutation—or, in this case, craftsmanship error. "We found that if you try to replicate a sound hole exactly from the last one you made, you'll always have a little error," says Nicholas Makris, a professor of mechanical and ocean engineering at MIT. "You're cutting with a knife into thin wood and you can't get it perfectly, and the error we report is about 2 percent ... always within what would have happened if it was an evolutionary change, accidentally from random fluctuations." Makris stresses that while each violinmaker inarguably possessed a good ear—in order to recognize and replicate the violins that sounded best—whether they recognized the particular design elements that contribute to a more powerful sound is still up for debate. "People had to be listening, and had to be picking things that were more efficient, and were making good selection of what instrument to replicate," Makris says. "Whether they understood, 'Oh, we need to make [the sound hole] more slender,' we can't say. But they definitely knew what was a better instrument to replicate." Makris didn't originally set out to study violin acoustics: His work is primarily in ocean exploration with acoustics, developing and applying technology to sense marine life and ocean phenomenon over large areas. But about a decade ago, he took up a new hobby, playing the lute. "I'm an acoustics expert, but promised myself I wouldn't think about the acoustics of the instrument, I'm just going to play the thing," Makris remembers. That thinking didn't last long, as Makris started talking with lutemakers and players in an effort to better understand the instrument—which was once Europe's most popular, but became effectively extinct for centuries before its recent re-emergence. The lute is much quieter than the violin: In addition to other design differences, its sound holes are circular rather than f-shaped, with elaborate interior carvings known as rosettes, inherited from the lute's Middle Eastern ancestor, the oud. Several years ago, a noted lute player approached Makris with an intriguing quandary: Do the carvings within a lute's sound hole make a difference to the overall sound produced? Makris realized that the relevant frequencies of sound were in the range where airflow through the sound hole behaves nearly as an incompressible fluid, and enlisted the help of Yuming Liu, a principal research scientist in MIT's Department of Mechanical Engineering. The team modeled the airflow through a simple round hole, as well as a more elaborately patterned hole of the same diameter, and found that in both cases, the air flowed fastest at the hole's periphery; its interior, whether open or partially filled, did not significantly affect the airflow. Answering the musician's simple question turned into a seven-year project in which the team examined the acoustic dynamics of stringed instruments through time, from the oud, lute, and medieval fiddles to the guitar and ultimately the violin—a period spanning from the 10th century to the 18th century. Analysis of the violin came at the urging of team member Roman Barnas, director of violinmaking and repair at the North Bennet Street School, an expert on the construction of early instruments. Throughout the 800-year period the researchers examined, they noted an evolution in sound-hole shape—from a simple round hole to a semicircle, which eventually morphed into a c-shape that grew more elongated, ultimately assuming the f-shape of the violin. The perimeter of these shapes steadily grew, while the area of the interior void gradually decreased. As with the evolution in length of the violin's f-hole during the Cremonese period, Makris' team found that the overall shape of the violin's ancestors slowly evolved to be more powerful and more acoustically efficient—though not necessarily by design. "We think these changes are still within the possibility of natural mutation," Makris says. "All of these subtle parameters of shape, we've modeled, and are able to make very good predictions on what the effects will be on frequency and power." Makris says the group's results may be useful for master violinmakers looking to design more powerful, fuller-sounding instruments—although he acknowledges that there's more to producing a quality violin than adjusting a few parameters. "Mystery is good, and there's magic in violinmaking," Makris says. "Some makers, I don't know how they do it—it's an art form. They have their techniques and methods. But here, for us, it's good to understand scientifically as much as you can." The sound that reaches the ears is probably as much to do with the room acoustics. It's a bit like the debate whether a 320bps is able to be discerned over lossless. Finally it must all be about the quality of the music itself. In a proper blind listening test amongst experts, I would doubt that a modern day top quality violin would be deemed of inferior quality to a Stradivari. Also the 'evolution' of the ƒ hole by darwinian selection sounds a bit far fetched. Surely the ƒ hole would be cut to a pattern. They would not make a new violin based on the last produced violin and even if a new one made a better sound due to an erroneous ƒ hole, then surely they'd cut a new pattern and then make them from that. Most likely they would already have experimented with the ƒ holes and decided what is a good size. Also it was not mentioned that the ƒ holes would obviously have a better sound than a round hole due to the two tangs that are produced from an ƒ cut hole. @someone Your analogy is incorrect. There is a world of difference in sound between a $1000 violin and a master violin; it has nothing to do with the room acoustics, or the quality of the music itself. Second, the article asks whether these sound-producing features were intentional or not: they were not intentional; they evolved. As for the experiments where musicians could not differentiate between a Stradivarius and a modern violin - maybe you can conclude that modern instruments are not far from Stradivarius quality (we should hope, right? ), but you may not conclude that all violins sound more or less the same. They really don't, and if you ever have a chance to hear a Stradivarius, you'll be in for a treat.
. . . Second, the article asks whether these sound-producing features were intentional or not: they were not intentional; they evolved. Maybe Lex can elaborate on his musical background, experience. I'm assuming to him, all violins sound the same. As one who has even made a few crude violins I can relate a story I heard from a real professional maker. "Playing high quality music in the maker's workshop gives the instrument soul and teaches it how to sing."